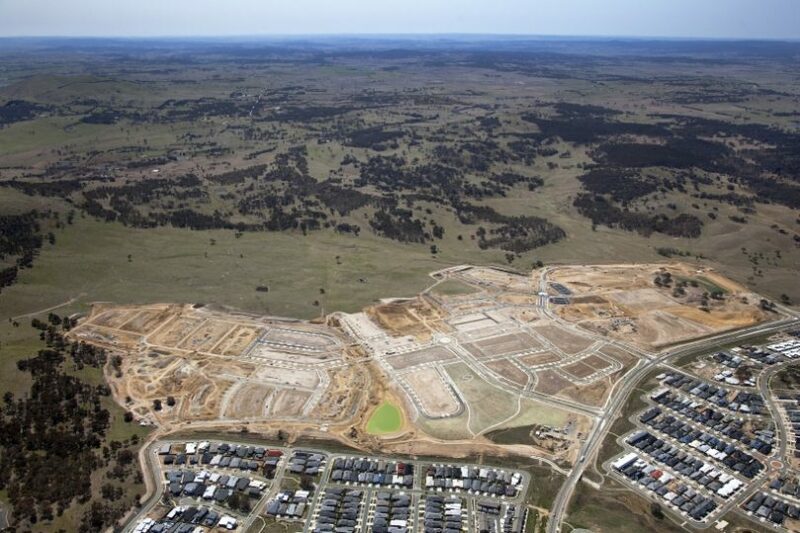 An aerial shot of Taylor as the suburb was taking shape in September 2017. Photos: SLA. A 175-strong parcel of single residential dwelling blocks in the new Gungahlin suburb of Taylor will start at $285,000 when they going under the hammer next week in a two-day auction at Exhibition Park. Independent Property Group, which is auctioning the blocks for the Suburban Land Agency, said it was one of the few releases by the SLA to disclose reserve prices, providing a realistic guide for buyers. The blocks range from 315 square metres to 938 square metres with the highest reserve at $530,000. 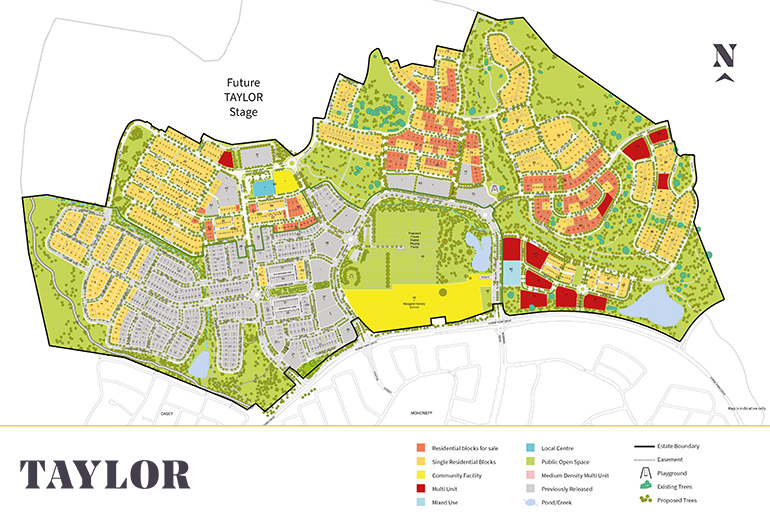 IPG’s Wayne Harriden said it was the cheapest SLA-owned land on the market in Gungahlin. He said that at an auction this week, all of the blocks bar one sold at the listed reserve price, which should give buyers confidence. “There is a real range of different blocks that cater for everybody, from small compact blocks up to those who want standard residential ones,” he said. The estate map from the November sales brochure. He said that with a primary school to open next year and plenty of open spaces, landscaping, water features, playing fields and community facilities, Taylor was a great suburb for families. He expected strong demand, with 60 registrations received by Friday. The auction will take place on 21 and 22 of November at the Fitzroy Pavilion, Exhibition Park. Check-in opens at 8 am and the auction will begin at 9 am. Photo identification and a 5 per cent deposit is required. The SLA said 14 residential blocks in Taylor sold at auction on the Wednesday week for a combined total of $4,707,000. The remaining blocks – within walking distance of the proposed local centre site, the Margaret Hendry School and the future district playing fields – are now available for sale over the counter as packaged lots. $900+ per square metre of land for TINY blocks in a remote cookie cutter suburb, and then you have to build, with some of the highest construction/tradie costs in the nation. LOL. And yet, every block in Oaks Estate is 1012m with existing houses that sell for under $500k, 15mins drive from Civic and Woden (during peak hour!) 60 seconds from QBN with all its amenities. Nearly $1000 per Square Meter... Government is looting Canberrians. Building a decent (standard) house in Taylor is going to cost nearly $1 Mil. Rip off.. But people run there and pay for tiny 300 to 500sq blocks. Their lining up and paying huge money. If they didnt then the government wouldn't get away with it. More heritage lost to cashed up developers. The standard approach to revenue raising by a hopeless government. Mat Barber the heritage of the farms and grasslands that existed befire we stuck suburbs all over them. Stephen Esdaile so where do you live then? I can all but guarantee if anywhere in Canberra it was once “heritage” farm land or bushland. But that’s ok isn’t it? And BTW Taylor is not being developed by cashed up developers. It is being developed by the government. The point I was making is that Canberra's heritage is in the farmland that is was settled on and there's precious little left. When Canberra was settled in the early 1900s, it was described as 'a good sheep paddock ruined', and we are still ruining it. What remains is a tangible link to our history, but it is being destroyed through development. I think Canberra should be going up, not out and what's left should be protected. Even the Yass council is more concerned about the region's farming heritage being preserved than the ACT Government. Stephen Esdaile but clearly it was ok to destroy this so called heritage for your plot of land? Are they houses? They look like cars in a car park! !